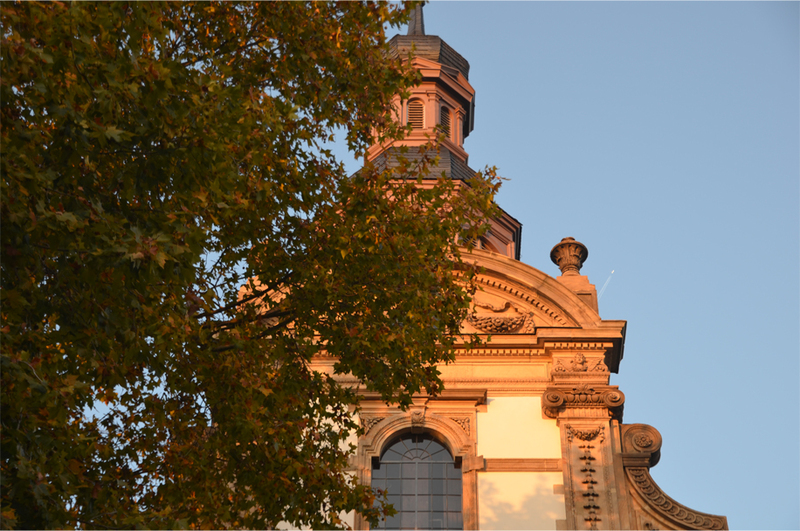 Beside the pink sandstone walls of Speyer Cathedral, we came across a musician in the shade of a plane tree, performing a personal rendition of Bach. 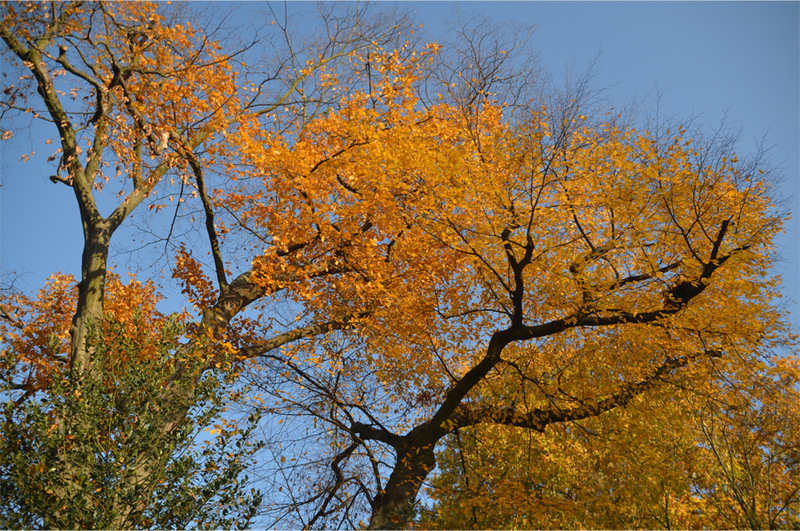 From his glockenspiel the familiar notes of Jesu, Joy of Man’s Desiring rang through the crisp November air, and I breathed in its magic as we admired the changing leaves of autumn. My sister and I had opted to spend a slow Sunday afternoon in one of Germany’s oldest cities, with more than 2000 years of recorded history. 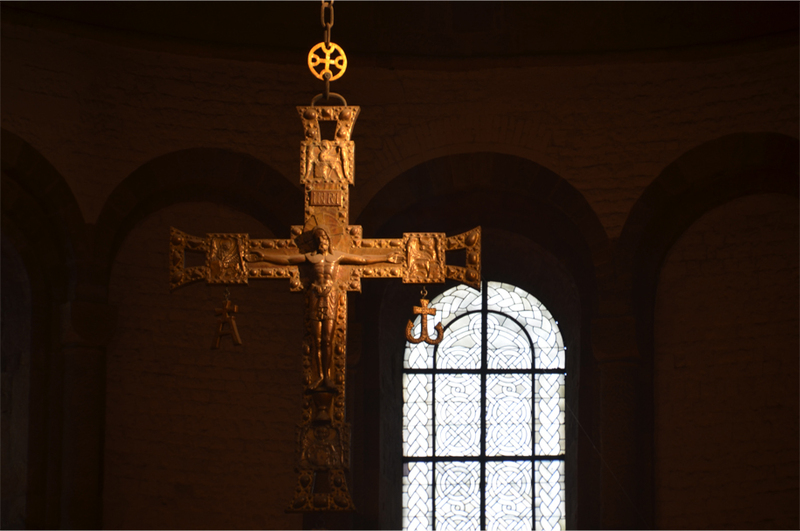 From the outset, Speyer (pronounced “schpy-er”) was an enchanting alternative to Heidelberg. 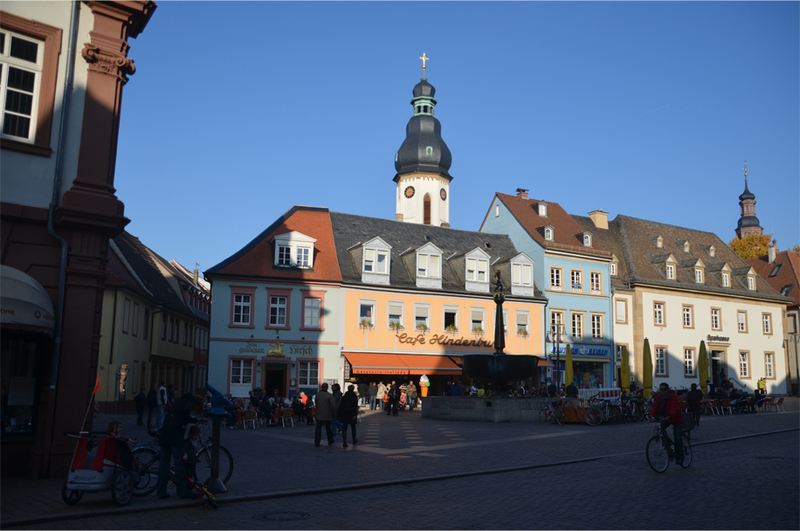 For someone unaccustomed to medieval German townscapes, it came as a vision straight out of the Brothers Grimm. 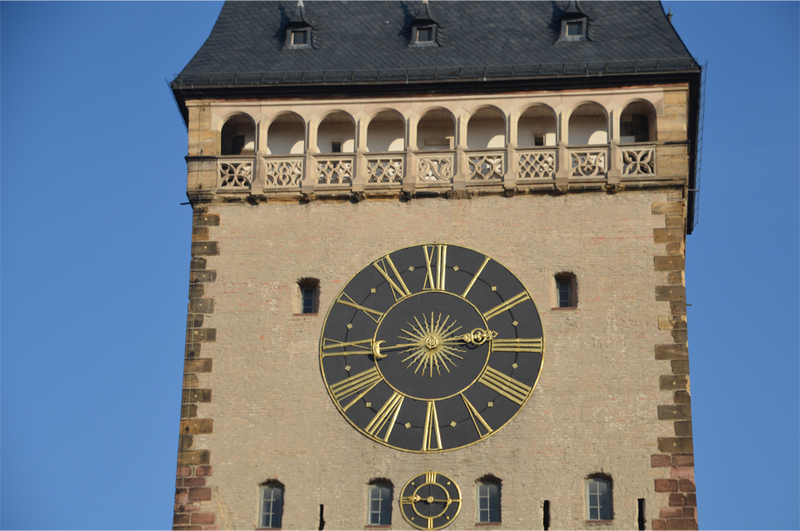 On the edge of the old town, the 15th-century Altpörtel loomed large, with its impressive clock face in black and gold, an arched gallery running high above our heads, and a steeply pitched, 20-metre roof that culminated in a baroque lantern. We peered through the gateway down the length of Maximilianstrasse, towards the gingerbread patterns and copper spires of the Romanesque cathedral. 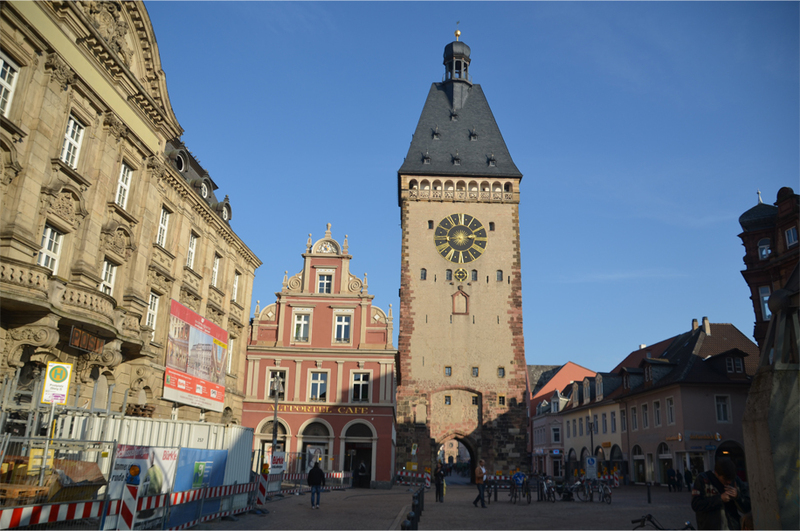 Up to 30 metres wide, the main street was once used as a triumphal way for the Holy Roman Emperor and his court. In 1024, Conrad II, a nobleman from Speyer, was elected king of Germany before being crowned Holy Roman Emperor three years later. Under his rule, construction on a monumental cathedral was started (1030), spurring the city’s growth and cementing its position as a spiritual centre for imperial power. When completed in 1111, the structure was the largest church of its time. 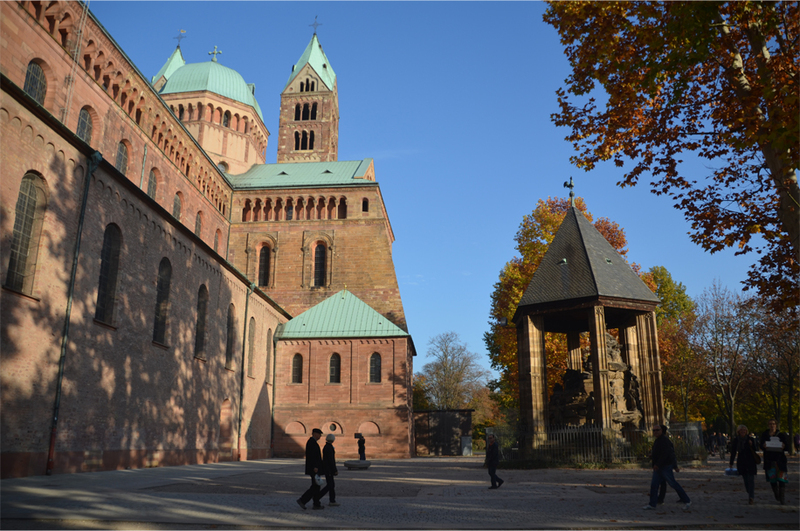 Speyer Cathedral became the resting place for eight German kings and emperors, and a tomb inside the crypt was even intended for Barbarossa. Today the building has been declared a UNESCO World Heritage Site, and it remains the world’s largest surviving Romanesque church. Down a street from the cathedral lies the Judenhof (Jews’ Court), with the oldest remains of a synagogue found in Central Europe. Here, we descended into an underground chamber to see the medieval Jewish ritual baths, or Mikvah, in a pool still fed by groundwater. Lit from a square opening in a vaulted ceiling, it had an almost mournful atmosphere. 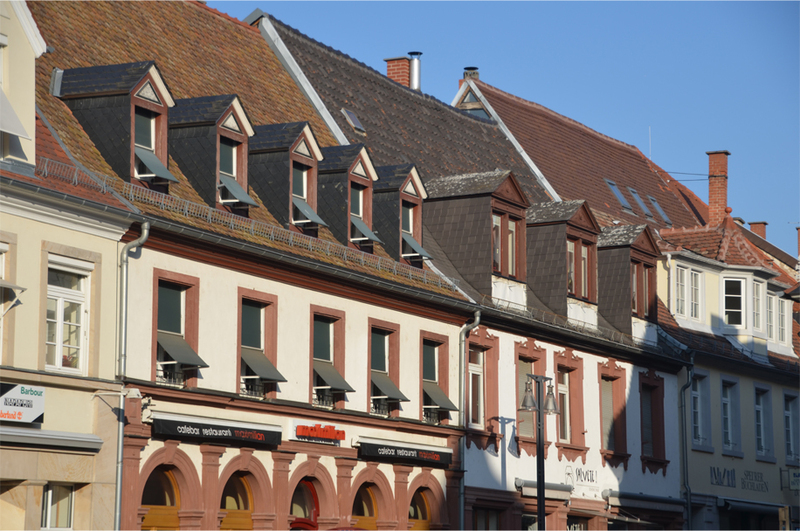 Speyer was once home to one of the most important Jewish communities of the Holy Roman Empire, and the city’s Hebrew name, Shpira, may have been the source of the Yiddish surnames Spira, Shapira, Spier and Shapiro. 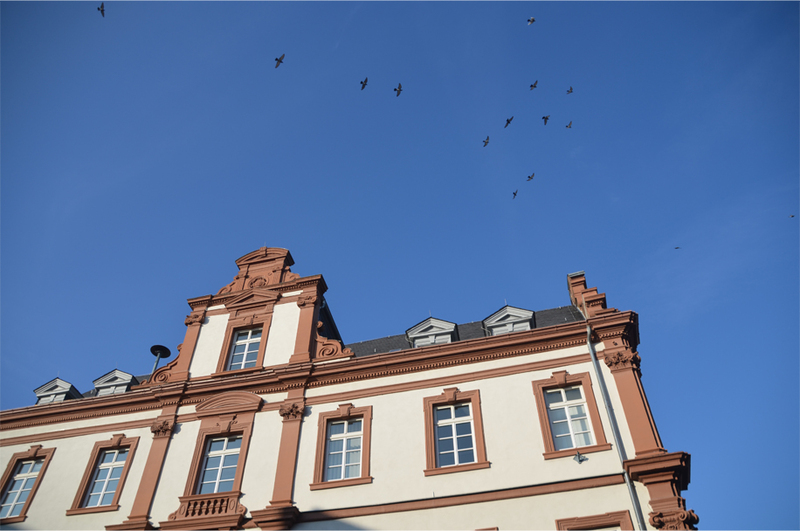 By the 16th century, the Jews of Speyer had endured many pogroms and countless instances of persecution. When the empire’s roving general assembly (the imperial diet) came to the city in 1544, its Jewish residents voiced their grievances to Emperor Charles V, who responded with a charter upholding their rights and privileges across the empire. A similar assembly 15 years earlier was marked by the Protestation at Speyer, in which the leaders of Lutheran states petitioned against the imperial ban on Martin Luther and his teachings. It was this event that would give the Protestant cause its name. Don’t miss some of the other churches. The interior of the Trinity Church is completely made out of wood: floor, walls (double gallery), and ceiling (18th century). I found it very amazing. Danke schön for the tips! 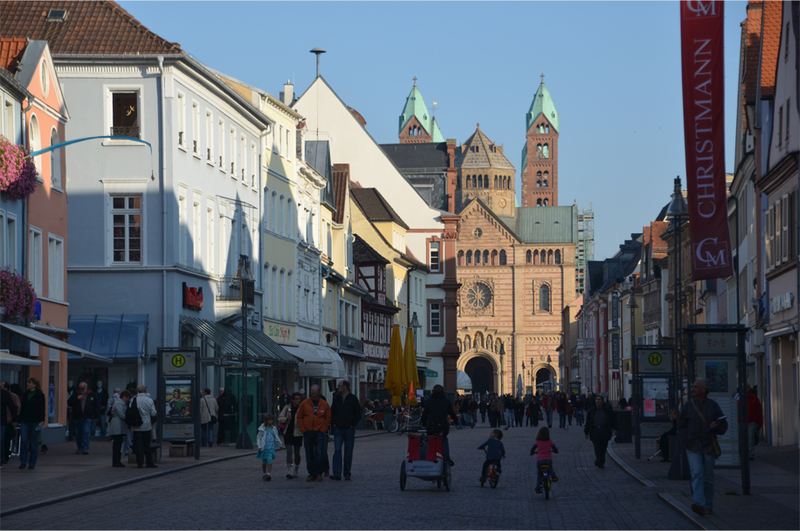 As Speyer is a town in my vicinity which I have visited several times throughout the years I am very pleased with your nice and beautiful blog post. 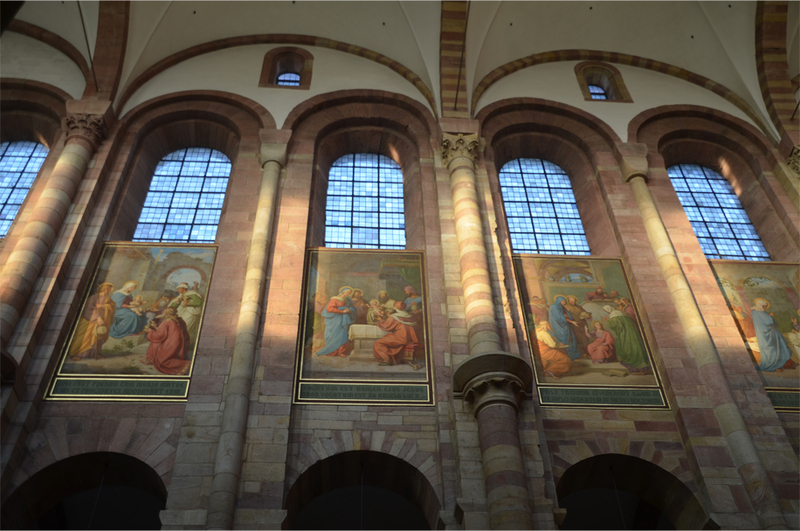 Glad you enjoyed it – while Heidelberg is very famous (and incredibly touristy), I think Speyer is quite the little-known gem. Hey, James – it’s always wonderful to discover a new place, especially along with you and your terrific shots and commentary. A gem indeed! Hi James, another great post and amazing photos from one of the cities in my home country. Even though I am german I haven’t been to Speyer yet, but apparently I have to give it a go. 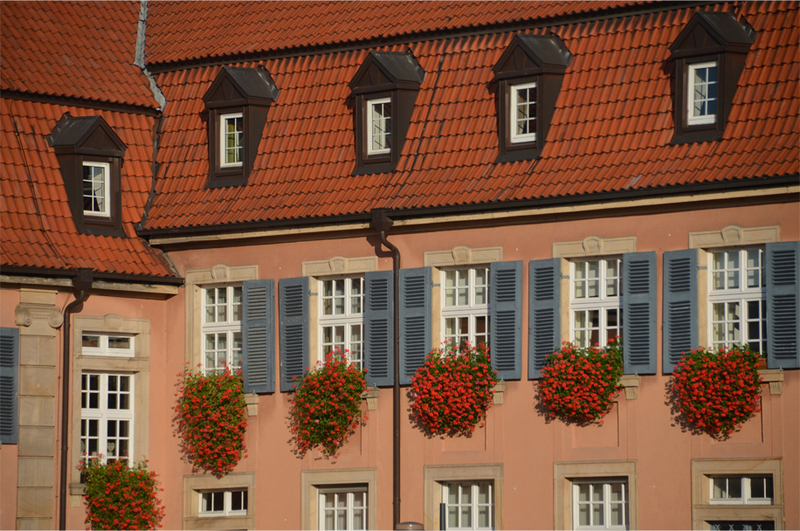 It seems as you have been to quite a few places in Germany, where else have you been? Thank you, Vanessa! So far I’ve only been to Berlin and a few places along the Rhine – I would love to take a trip through Bavaria (especially Munich), but Ulm was the farthest I got! Then there’s historic cities like Lübeck and Dresden that are also on my wishlist… my father tells me Hamburg was a lovely surprise. Hamburg and Lübeck are definitely worth a visit. My boyfriend originally comes from a small town between Hamburg and Lübeck, so I have been to that area several times and really like it. I haven’t been to Dresden yet, but it must be amazing. 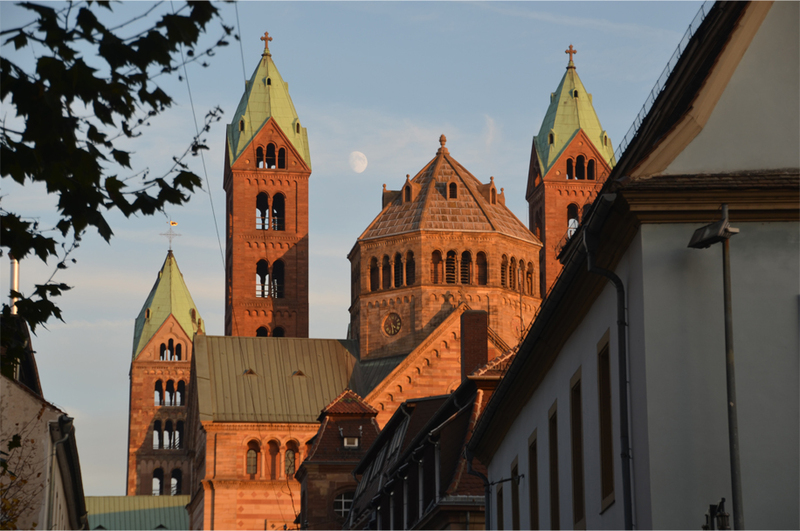 Speyer is definitely more worth a visit than Heidelberg – thanks for sharing the beautiful pictures! Thank you, Terri. I really felt the weight of history when we visited the old Jewish ritual baths – it had been abandoned long before World War II, but you still sensed the tragic fate of the community. I’m glad to know the Jewish quarters of Eastern Europe are slowly bouncing back. Hi Suze! It’s already Wednesday here but thanks for the nomination all the same. 🙂 As usual your photos are stunning and I love the rich colours and sense of scale. Wow, such a charming city. And your pictures are beautiful too. 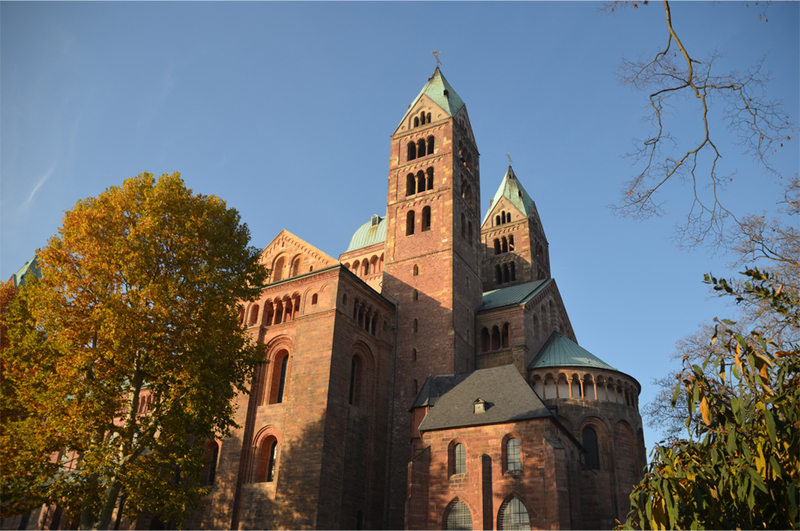 You’re right – Speyer has a fairytale charm, and even more so in the autumn! I really wish I budgeted more time there instead of going for just a short afternoon. What wonderful photographs, James! Wonderful commentary, also. I always enjoy reading your blogs, particularly when you provide a great history lesson as well! Definitely on my growing must-see list!